Completely re-designed for 2018, the all-new Trail brings a level of performance and handling normally reserved for far more expensive machines. Its confident geometry, dialed spec and advanced frame technology make a difference you can feel from the first pedal stroke. With Shimano hydraulic brakes throughout, reliable 2x drivetrains, great tyres and wheels, Trails are ready to rock. Trail bikes are designed with 27.5” on the smallest size and 29” wheels for the larger sizes to offer the best possible blend of fit, fast and fun for all riders. 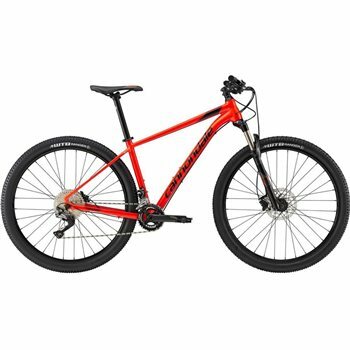 Active or aspiring mountain bikers looking for an affordable upgrade or a first bike that’s a cut above. Fast Trail Geometry - Semi upright body position strikes a great balance between comfort and performance. Wheel Size: M, L, XL - 29"/S - 27.5". Fork: RockShox Judy Silver, 100mm, tapered steerer, Solo Air, 15x110mm Maxle Stealth, 51mm offset. Rims: WTB STX TCS i23m 32 hole, tubeless ready. Hubs: Formula 110x15 front, Custom BOOST QR Formula rear. Tires: WTB Ranger Comp 27.5/29x2.25" DNA Compound. Crank: FSA Comet MegaExo, 36/26, 11-speed. Rear Derailleur: Shimano SLX, 11-speed Shadow Plus. Shifters: Shimano SLX , 2x11. Handlebar: Cannondale C3 riser, Alloy, 4° upsweep, 9° backsweep, 760x15mm. Stem: Cannondale C3, 6061 Alloy, 1-1/8", 31.8, 5°. Brakes: Shimano M425 hydro disc, 180/160mm (29"), 160/160mm (27.5"). Brake Levers: Shimano M425 hydro disc. Seatpost: Cannondale C3, 6061 alloy, 31.6x350mm (S,M) 400mm (L,X). Lightweight SmartForm C2 Alloy Construction with a Lifetime Guarantee. Modern, Longer and Slacker Dirt Tailored Geometry. Vibration damping SAVE Rear Stays. Tapered Head Tube for Responsive. Clean and simple Internal Cable Routing.